A modern take on the classic hoodie. Sweater knit fleece offers cozy comfort and technical performance, while a brushed outer provides the look of wool. A wide neck, ruching and contrast zipper are a few features that take this sweater fleece from the everyday to the extraordinary. Living in Jackson Hole, we love fleece. It’s an athletic staple that’s also welcome at practically any mountain town function. 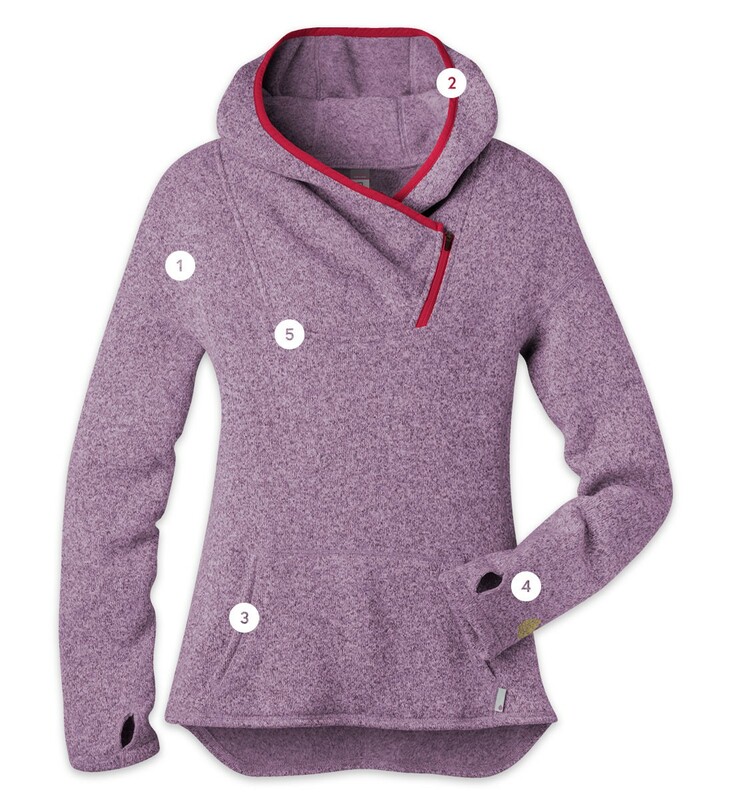 This casual fleece hoodie with a sweater knit face and cozy, brushed interior comes in poppy colors and boasts stylish feminine details that elevate your look from everyday fleece. Supremely comfortable, its wide neckline and unique front zipper allow for easy on-and-off. Features include princess seam lines, a drop tail hem, and a ruched collar with a contrast zipper at the neck. Thumbholes provide additional warmth for when temps fall low. Lofton™ Sweater Fleece is a unique, 100% polyester textile with a sweater knit face for a wool exterior appearance and a soft, brushed interior for maximum comfort. A superb lightweight insulator, it's hydrophobic qualities shed moisture and allow the fabric to dry quickly. Treated to reduce pilling. 100% Polyester, 330 g/m2. Center back length, 28 1/2"
So soft it’s hard not to live in. "Slip on Stio's Sweetwater Fleece Hoodie and it will become a quick favorite. What you'll appreciate most is its versatility - wear it to work with a skirt, under your ski jacket as a midlayer and around the house with pajama bottoms on off-days"